Live the Ketogenic Diet Easily and Deliciously! You love your Paleo or low-carb diet, but is it enough to give your metabolism the jolt it needs to really burn off that extra weight in order to live a healthier life? By eating foods higher in good fats, moderate protein, and little-to-no carbohydrates, you'll feel less hungry. Not only that, but your body begins to burn fats stores instead of the carbohydrates and glucose that usually bog down your system. 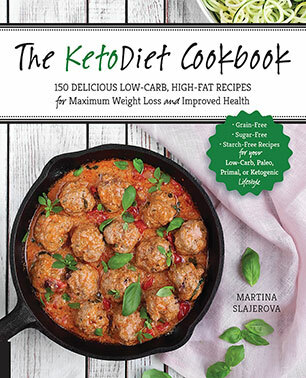 The KetoDiet Cookbook contains 150 recipes and practical information for living and adhering to a ketogenic lifestyle. Martina Slajerova, founder of the KetoDiet blog, provides a complete guide to the ketogenic diet based on the most recent research. Discover the science behind the ketogenic diet and the abundant practical solutions that benefit both beginners and advanced keto- dieters. Recipes featured in The KetoDiet Cookbook are totally free of: grain, sugar, legumes, additives/artificial sweeteners, unhealthy oils/fats. Dairy-free options are also included. With soups, breakfasts, appetizers, sides, and sauces, you'll be enjoying delicious meals while giving your body the boost it deserves! Martina Slajerova is the founder of the KetoDiet blog and the KetoDiet app. Brought to the diet after being diagnosed with Hashimoto's Disease in 2011, Martina, frustrated with the lack of practical resources, created the KetoDiet app/blog to help others live the Ketogenic lifestyle successfully.